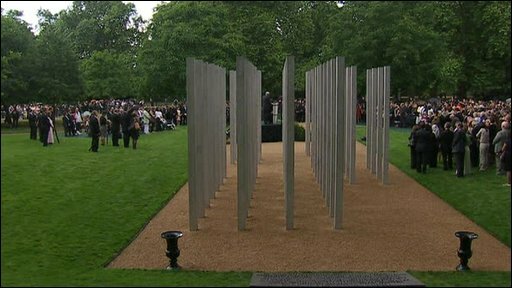 Prince Charles has paid tribute to the families who lost loved ones in the 7 July 2005 London bombings, at a memorial in Hyde Park. He said that their bravery "offered us hope for the future". Prime Minister Gordon Brown and Minister for London Tessa Jowell joined the Prince of Wales at the unveiling of the 52 steel pillars. Fifty-two people died after suicide bombers detonated explosives on board three Underground trains and a bus. The victims' relatives at the unveiling said the permanent memorial, between the park's Lover's Walk and Park Lane, was a "fitting tribute". "When the bombers struck", one of the bereaved told me, "they took away my today and my tomorrow." Four years on, the emotions are still raw, but mixed with the pain is a sense of pride that a national memorial now exists. What was very striking about this simple, sombre service was the sheer number of relatives gathered in front of the 52 stainless steel pillars. Hundreds of lives have been affected directly by the attacks. Their loved ones were of all ages, both sexes and many races. After Prince Charles had delivered a powerful and personal address, the relatives, in the pouring rain, moved forward and placed flowers beside the memorial. I saw a boy in shorts and a baseball cap next to an elderly woman in a wheelchair. They all brought roses. A red one symbolising love, a white rose for peace. Prince Charles said the date of the bombings "would be etched vividly on all our minds as a brutal intrusion into the lives of thousands of people". He said: "The families of the victims, the survivors and the stout hearted emergency services remain very much in our thoughts and prayers. "You are a moving example of holding together bravery in the face of such inhuman and deplorable outrage and you offer us hope for the future," he added. Architects Carmody Groarke said the 3.5m (11.5ft) tall stainless steel pillars symbolised the random nature of the loss of life - how it could have been anyone travelling in London that day. Mrs Jowell said that each column represented "a unique person and a unique grief." She added: "Each one casts a shadow just as they do - each one standing tall and proud just as they did, and each one will in an individual way absorb and reflect light just as they did." Director Kevin Carmody said the firm worked closely with the families through monthly liaison meetings to ensure the finished product was what they required. "It took a long time to get to the strong ideas like symbolising the single and collective loss of life," he said. He said 26 of the stelae were grouped to represent those killed on the Underground near King's Cross. Other clusters represented Tube bombing victims at Aldgate and Edgware Road, with the remainder symbolic of those who died on the number 30 bus in Tavistock Square. "Hopefully people will have an almost magnetic propulsion towards it," said Mr Carmody. He said it could be viewed from afar as a single entity but that as they moved closer, people would discover the significance of the four groupings and individual columns. Though the stelae are anonymous, they are inscribed with the date, time and location of the bombings they represent. "We're very happy that the families are pleased with the result," Mr Carmody added. A representative of the bereaved families' group said: "The memorial is a fitting tribute, honouring the 52 lives lost on 7 July 2005, ensuring that the world will never forget them. "It represents the enormity of our loss, both on a personal and public level. "We hope this memorial will speak to visitors so they can understand the impact of these horrific events." Thanks to the open casting process used to make the columns, with molten stainless-steel being poured into sand moulds, each one has a unique finish. 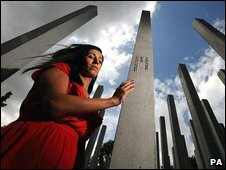 Saba Mozakka, 28, from Finchley, north London, was one of six family members to sit on a liaison board during the memorial's design. Her mother, Behnaz Mozakka, 47, a biomedical officer, was killed on a Piccadilly line train near King's Cross station while commuting to work. Ms Mozakka described the memorial as "truly incredible". "I'm very happy. It's very poignant," she said. "It's an amazing tribute to my mum and the 51 others who were so viciously and brutally taken from us." Grahame Russell, whose 28-year-old son Philip died in the Tavistock Square bus bombing, said the ceremony had been "extremely moving, extremely poignant". He added: "The speakers were outstanding. You could see by their faces and the way they spoke that they understood the way we feel." In his speech, Prince Charles said he had some awareness of the loss felt by the relatives as he recalled his "deep despair" after his great-uncle Lord Mountbatten was killed in an Irish Republican Army bomb blast almost 30 years ago. After he and Mrs Jowell addressed the memorial service, the names of the victims were read out and a minute's silence was observed. The prince then laid a wreath on behalf of the nation while the Duchess of Cornwall left a floral tribute for the families. In addition to the prime minister and London Mayor Boris Johnson, Conservative leader David Cameron, Liberal Democrat leader Nick Clegg, former London Mayor Ken Livingstone and senior figures from the emergency services were present. The dedication ceremony came on the same day that the Home Affairs Committee began its inquiry into the events of 7 July. It is expected to seek evidence from senior intelligence officials as it examines the police and government response to the attacks. How do you build a modern memorial?